Your brand is an idea, needing a coherent voice. Your brand best unfolds in person. We respect audiences as human beings, and speak to them as such. Your brand already has an audience—though you may have never met. Your brand is a blueprint, needing three-dimensional expression. At Treebird, we are not magicians or svengalis or hucksters or blusterers. Your brand is the fulfillment of your passions. We know design and writing and marketing and branding. We are thinkers and communicators and aesthetes and standard bearers. your brand is ready to take root in fertile soil. At Treebird we don’t believe that brands are simply “launched.” Instead, we take the time to carefully nurture, cultivate, and grow your brand—from the seed of an initial brainwave into a fully realized, living idea that announces itself truthfully and evocatively to target audiences. Likewise, rebranding requires just as much—if not more—thinking, creativity, and analysis to retain the essence of your existing brand and communicate that core in freshly compelling and distinctive ways. So whether you’re coming to us with an idea and a dream (and a budget) or you’re already well-established and seeking better brand consistency or more than simple “maintenance”, we meet you where you are, and help you get to where you want to be. Why you choose Treebird as a creative branding partner has everything to do with why we exist in the first place. We all live in a designed world. And it’s our imperative to not simply inhabit that world, but to shape our surroundings in productive and positive ways through our own thinking, actions, and design. Practically speaking, design matters because design influences people’s behavior. Design creates a first impression, communicates a value, and establishes a relationship. Design differentiates in a world flooded with stimuli. Design creates meaning, not only through color and font and graphics, but in how it treats and portrays words and augments their meaning. And design, as a disciplined process, offers structure, manages risks, and aligns goals. On the surface, the outcome of our partnership may seem like a collection of things—graphic identities, logos, taglines, ads, postcards, lookbooks, etc. But just as a guest in your home doesn’t see simply floorboards and drywall, doorknobs and molding, but rather experiences the feeling your home conveys, so too does your brand exist as a whole and fully transferable idea, much more than the sum of its parts. And we achieve the transformation through design, which to us means always asking and answering the primal question of why? Authentic and compelling branding sets just the right expectations--which means you have to present yourself just so. But without seeming finicky. Unless your brand is finicky. We process information through our eyes more than any other sense. The entire human world is designed. So let’s be good at it. We consider our services or social more of a partnership than management. We create, plan and execute while you engage with your audience. Stories convince people. By telling stories, you make the case for why you matter. 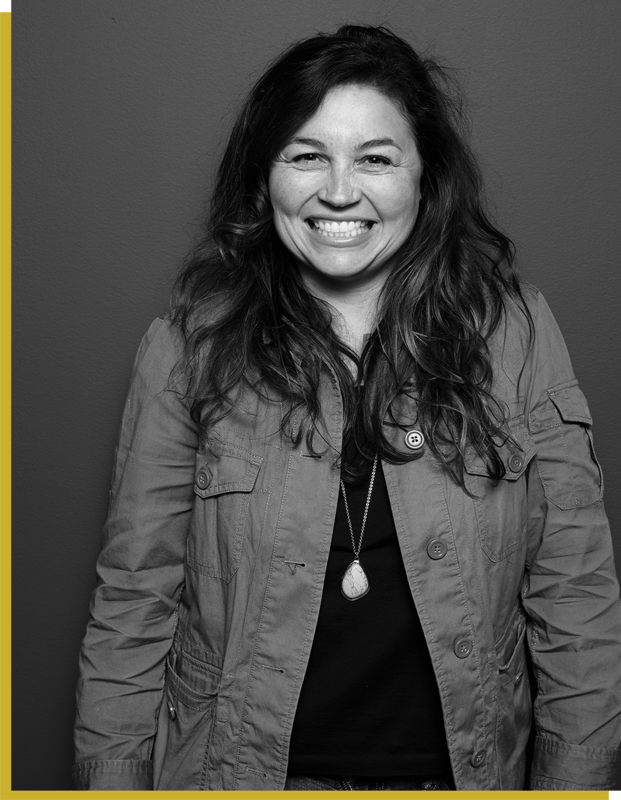 Jaci’s quick wit, intent listening, and native intelligence come across as soon as you meet her—and carry over to her branding and graphic identity solutions, where she fuses strategy and sophistication, daring and restraint in just the right doses. With a dual focus on creating original branding for new concepts and revitalizing the look and feel of even the most-established brands, Jaci approaches each project with a fresh, thoughtful, and insightful perspective. While she recognizes the relevance of current trends, she’s hyper-conscious of the fine line that separates “trend” from “fad,” and tends toward more timeless and classic looks for her clients. Jaci has quickly grown Treebird from a home-based start-up into a fully staffed firm by serving, first and foremost, as a trusted listener and a voracious learner. No matter the industry, Jaci wants to hear the story first, learn the background, and only then does she shift to her role as a cultivator of ideas. She values close working relationships, partnering on design and branding projects with visionaries, entrepreneurs, and business leaders whom she admires greatly and whose own passion elevates her own sense of what’s possible through elegantly executed design, branding, and communication. Clients bring Jaci ideas—sometimes raw, sometimes more polished—and she helps them breathe life and vigor into each concept and project. In addition to serving as Jaci’s fulltime thinking partner, Patrick heads up all things editorial at Treebird. A fiction writer by nature, Patrick transitioned to the world of strategic branding in 2005 where he brings a literary sensibility to bear on market realities. Patrick is something of an editorial chameleon, capable of writing across a spectrum of styles, from widely disparate points of view, and to a variety of audiences, all while maintaining a convincing and compelling voice that stems from his dual insistence on empathy and story. Patrick earned a dual B.A. in English and political science from the University of Notre Dame and an MFA in creative writing from Purdue University, where he also taught composition and intro to creative writing and served as fiction editor of the university’s literary journal. Erin is Treebird’s all-around art enthusiast, which also makes her our resident illustrator. So when it comes to hand-done type, hand-crafted patterns, and hilarious doodles of animals and Bob’s Burgers’ characters, Erin takes the lead. A consummate learner, Erin constantly experiments with new crafts and mediums, from illustration to painting to textile design, to see how she can integrate fresh elements into her work. She also brings the fun to the office, and has rarely met a pun she did not like. A native of Wilmington, North Carolina and later a resident of Orlando, Erin attended the Savannah College of Art and Design, where she received her BFA in graphic design with a background in Fibers. While in Savannah, she also worked for SCAD’s Working Class Studio for two years, where she learned the art of production and the ins and outs of how a small business runs—skills that come in pretty handy at Treebird. Adroit, analytical, and assiduous, Angie is affectionally known around the office as “the cleaner.” After the rest of the ‘birds invariably weave their path of creative destruction, Angie swoops in afterward and cleans data, audits information, organizes files, and keeps meticulous records. As a wife and mother of two, she’s quite used to this role. Angie also brings more than eight years of professional experience to Treebird; in her previous life, she was a stalwart at recruiting, event planning, internship program management, and diversity initiatives at a major law firm. A proud native daughter of Milwaukee, she knows her way around Summerfest, the State Fair, and Friday fish fries. Angie graduated from St. Norbert College with a Bachelor’s degree in communication and leadership. Jessica brings more than 14 years of marketing and communications experience to Treebird, where she employs her big left brain to help tame the wild and wooly right brains of her colleagues. As project manager, Jessica ensures open lines of communication between clients and designers, tracks the progress of each program, manages production calendars, and navigates last-minute changes with aplomb. She also creates marketing plans and status reports, organizes as if it’s her sixth sense, and does it all with a great sense of humor. Prior to joining Treebird, Jessica held roles as marketing manager and senior marketing manager in various industries across metro Atlanta. She holds a B.S. in social work from the University of South Florida, and is the proud mom of two precocious kids. Lauren combines her natural creativity with a measured and analytical mind, always putting the client’s needs first and tailoring her design to solve problems and provide appealing visual solutions. Equally skilled at logos and labels, packaging and websites, Lauren produces the full array of Treebird deliverables with efficiency and aplomb. She earned her B.F.A. from the Savannah College of Art and Design in graphic design, and has spent 14 years in the restaurant industry, valuable experience that has taught her the importance of fostering strong client relationships, developing time management skills, becoming adept at multi-tasking, and paying close attention to every detail. Rachel views her environment through the lens of an artist, and approaches her work at Treebird as a studied professional. She draws on her experience as a painter, drawer, and photographer to bring fresh, memorable approaches to her work with type, color, and user-based interactive design. She’s been called a “smile giver,” and her infectious personality comes through in her designs, which sparkle with confident risk-taking and reveal her deep intentionality. A Maryland native, Rachel graduated with a BFA in graphic design from James Madison University and has worked with numerous agencies in the D.C. area.